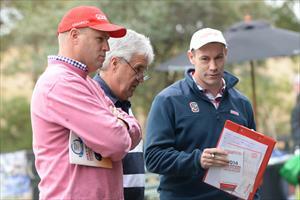 New Champion Thoroughbreds trainer Danny O'Brien was on hand at the Inglis Syndication Day on Sunday at Oaklands Junction to showcase the three quality colts he will train for the gun syndication company. Champion Director Jason Abrahams and Danny O’Brien spoke to the crowds, as can be seen the photo attached, at the Open Day about their decision to work together with syndicating horses. The pair provided a running commentary while the three yearlings paraded, outlining the qualities that made these three colts stand out and secure a spot on the pairs “must buy” list at this year's Karaka Sales. These three will be the first horses that Danny O'Brien will train for Champion Thoroughbreds, which is venturing into Victorian-based horses for the first time. "Jason has a fantastic track record of racing some wonderful horses with John O'Shea in Sydney and I was thrilled when he was looking to expand his syndication business into Victoria," O'Brien said. "To say we are starting with three cracking types is an understatement as we were thrilled with what we could secure at an excellent price point together in New Zealand this year."